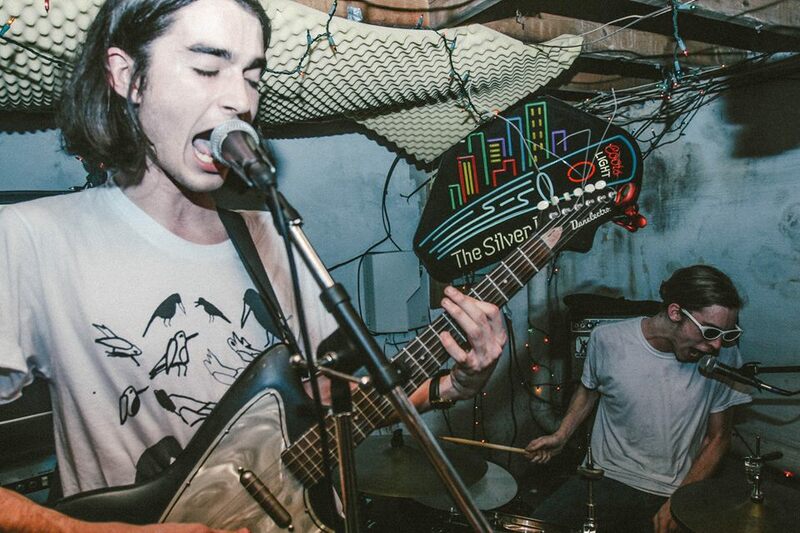 With a new album coming out on Lame-O records in March that’s expected to sound drastically different from their previous releases, The Obsessives graced the Philly community not only with a secret show but also with an homage to the jams from albums past. This Saturday, as over a hundred people flooded into a small basement, The Obsessives inched their way through the crowd carrying huge amps as they prepared for their “last two-piece set for a while.” Despite upgrading to a line-up of five, The Obsessives nevertheless helped us remember that it only takes two of them to make an entire basement come to life. The DC/Philly based duo immediately took us back to 2014 with “Blackberry Tint,” a heavy hit with crunchy guitars from Bad Friends, their second EP. As the crowd backed Nick and shouted every word, you forgot that this song was independently released three years ago before their claim to fame. It just goes to show the timelessness of their writing because Blackberry Tint was not the exception to this example of fan devotion. Just as The Obs played through their old repertoire like they’d never stopped playing them, the crowd sang along to each song as though they had never stopped listening to them. Having personally seen the obsessives probably more than 20 times in the past 4 years, I’m forced to remember some of the first demos they released tinged with “their misplaced love for blues rock.” I remember the first few shows the played and how moving it was to see two people make a sound so well put together. I remember when they stopped playing blues rock and started making emo, and now I’ll remember when they transitioned seamlessly from “bored,” a cathartic classic off of 2015’s Heck No, Nancy, into a quick and catchy banger ridden with ear-bugs from their new self-titled album. Their creative process moves lightning fast, and you start missing the old songs while they send more and more new material your way. But while sounds change and line-ups change one thing remains clear, and as Nick belted the lines “you already know//where Jackson and I are gonna go” you’re made to remember exactly what that thing is. In light of all these changes, The Obsessives are and always will be the product of two friends who worked hard to watch their dreams come true, and if that doesn’t inspire you, I’m not sure I know what will. I’m excited to see where the beloved gruesome twosome really does end up. Don’t forget to pre-order a record soon, because the next one will probably be out before we get a chance to learn all the lyrics.